You must make reservations at least 5 minutes in advance of the time at RockBass Grill. Private dinning is available for up to 30 guests. RockBass Grill features casual dinning offering fresh cut fish & steaks. We offer a raw bar that changes on a regular basis. Enjoy dining with a view of the Susquehanna River. A private dinning room for up to 30 people is available. crispy gulf shrimp in a spicy chili aioli sauce. delicate blend of crab & cheeses baked to a golden brown in a sourdough bread bowl. served with carrot sticks and celery. u-15 shrimp steamed then chilled. served in a martini glass with cocktail sauce. tender calamari lightly breaded and fried. served with a side of marinara sauce. five oysters served with creamed spinach and parmesan cheese. three of our bite sized crab cakes baked to a golden brown. served with tartar sauce. four u-15 shrimp coated in our homemade coconut batter and deep fried to a golden brown. served with a side of our zesty orange marmalade. sesame seared yellow fin tuna sliced, served with a side of pickled ginger and wasabi paste. freshly breaded chicken tenderloins, deep fried to a golden brown atop a bed of golden fries with barbeque sauce and ranch dressing for dipping. a creamy blend of spinach, artichokes and parmesan cheese in a sourdough bread bowl and baked to a golden brown. served with celery and carrots. served with cajan remoulade sauce. freshly breaded mozzarella slices fried to a golden brown. served with marinara sauce. served with a side of mignonette sauce. fresh shucked oyster served with a shot of chilled vodka and cocktail sauce. steamed mussels tossed in garlic butter sauce. one pound of our freshly steamed clams, served with a side of drawn butter. 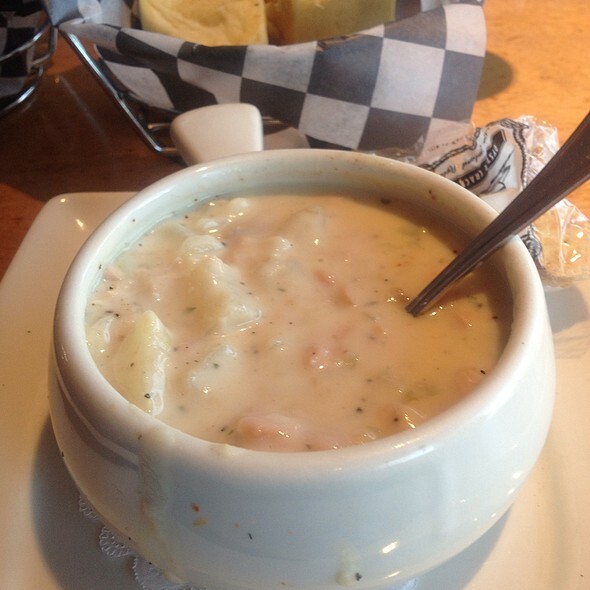 our own homemade clam chowder served with clams in the shell in the chowder!! dressings: italian, ranch, french, honey dijon, bleu cheese, balsamic (house), parmesan peppercorn, thousand island, raspberry vinaigrette, greek, oil & vinegar. iceberg lettuce, bacon & hard boiled eggs served with bleu cheese dressing. crisp romaine lettuce, freshly grated parmesan cheese, homemade croutons and caesar dressing. sliced chicken, steamed shrimp pieces, tomatoes, avocados, chopped bacon and cucumbers atop a bed of our fresh salad mix. served with your choice of dressing. one of our famous crab cakes, broiled and placed on a bed of salad mix, tomatoes, cucumbers and portabella mushrooms. served with you choice of dressing. grilled sirloin steak pieces, bleu cheese, tomato, red onion and roasted red peppers atop a bed of fresh salad mix. served with your choice of dressing. freshly grilled chicken tenders, dried cranberries, apples, diced tomatoes and salad mix chopped and served with your choice of dressing. voted best salad on the menu!!! enjoy our freshly prepared salmon filet topped with our homemade hoisin glaze and baked to perfection. served atop a bed of romaine lettuce with fried egg noodles, mandarin oranges and our homemade asian slaw. topped with our own sesame garlic dressing. all sandwiches served with choice of fries, chips or cole slaw. wrap choices: plain, spinach or sun dried tomato. enjoy our homemade crab cake, either broiled or fried. served on a kaiser roll with lettuce, tomato and onion. freshly sliced prime rib, sauteed with onions and provolone cheese, piled high between two pieces of grilled panini bread. served with a side of au jus. fresh grilled chicken, romaine lettuce, parmesan cheese, caesar dressing and served in your choice of wraps. freshly sliced corned beef, russian dressing, swiss cheese and sauerkraut served on our thick sliced rye bread. freshly sliced turkey, provolone cheese, bacon, lettuce and tomato packed inside three pieces of thick sliced white bread. a freshly cut 6 oz. portion of yellow fin tuna, wood fire grilled or wood fire blackened. served on a fresh baked roll with lettuce, tomato, onion and a side of tobasco aioli. freshly battered white fish deep fried to a golden brown. served on a fresh baked roll with lettuce, tomato and onion. a generous portion of freshly sliced honey ham topped with melted provolone cheese. served on toasted italian panini bread. fresh grilled chicken tenders, crumbled bleu cheese and romaine lettuce tossed in a spicey buffalo sauce and served in the wrap of your choice. grilled mahi mahi with ancho chipolte sauce, crab and corn salsa and rice pilaf. served with your choice of sweet potato fries,regular fries, fresh cole slaw or cucumber salad. fresh sliced turkey, ham, bacon, lettuce, tomato and mayonnaise in a spinach tortilla. served with choice of sweet potato fries, regular fries or cole slaw. all rockbass burgers are served with your choice of an 8 oz. black angus burger or an 8 oz. chicken breast on our fresh baked rolls. served with your choice of chips, fries, cole slaw or side salad. served on a fresh baked roll with lettuce, tomato and onion. wood fire grilled to desired temperature. freshly sliced mushrooms and swiss cheese. served on our fresh baked roll with lettuce, tomato and onions. our classic burger topped with a fresh broiled crab cake. served on our fresh baked roll with lettuce, tomato and onion. here at the rockbass grill, our fresh catches are our pride and joy! the black boards located throughout the dining room give you and your guests an extensive selection of fresh catches, the availability and their daily market price. all fresh catches are served with two sides. try it with crab dip or crab imperial. sauces: creamy dill sauce, lemon chive butter, tropical mango salsa. METHODS OF PREPARATION: Wood Fire Grilled, Broiled, Sauteed, Blackened. Have A Fresh Catch With Us And Enjoy! just pick your choice of fish, method of preparation, and choice of sauce. all rockbass steaks served with your choice of two sides. want to spruce up your steak or specialty selection, try crab dip or crab imperial! our 7 oz. filet mignon wood fire grilled to perfection. the traditional 7 oz. filet wood fire grilled and encrusted in bleu cheese. our juicy 14 oz. new york strip seasoned and wood fire grilled to perfection. a tender 10 oz. center cut sirloin seasoned and wood fire grilled to your liking. a juicy 14 oz. ribeye seasoned and wood fire grilled the way you like. 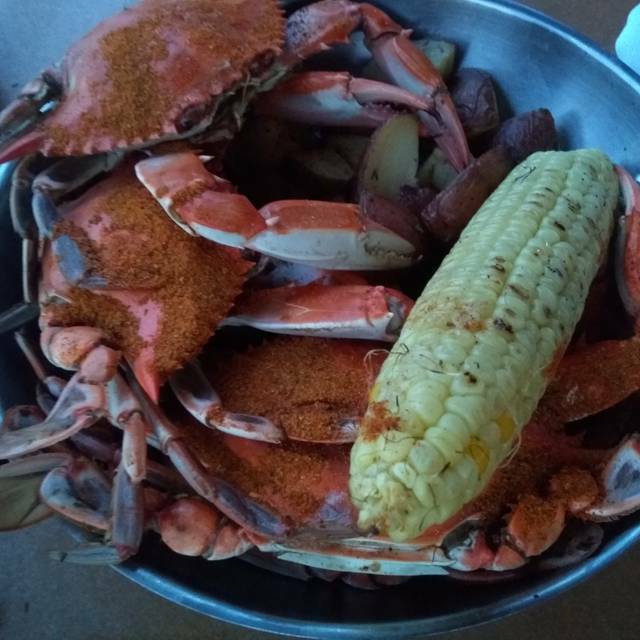 enjoy a single or double order of our homemade crab cakes broiled or fried to perfection. served with a side of tartar sauce. a delicate blend of crab, mayonnaise, seasonings and cheeses mixed together and baked to a golden brown. (5) of our u-15 shrimp hand battered and deep fried to order. served with a side of tartar and cocktail sauce. 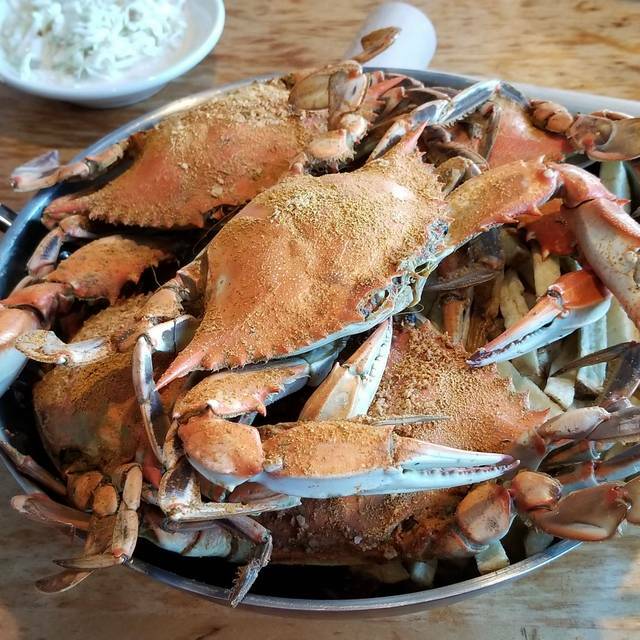 fresh flounder pieces stuffed with homemade crab imperial, baked to perfection. (4) hand battered shrimp and our famous broiled crab cake. served with a side of tartar and cocktail sauce. enjoy a crab cake, (4) shrimp, a generous portion of cod and (2) u-10 scallops, cooked to perfection. served with a side of cocktail and tartar sauce. (4) of our u-15 shrimp stuffed with our crab imperial and baked to perfection. served with cocktail and tarter sauce. 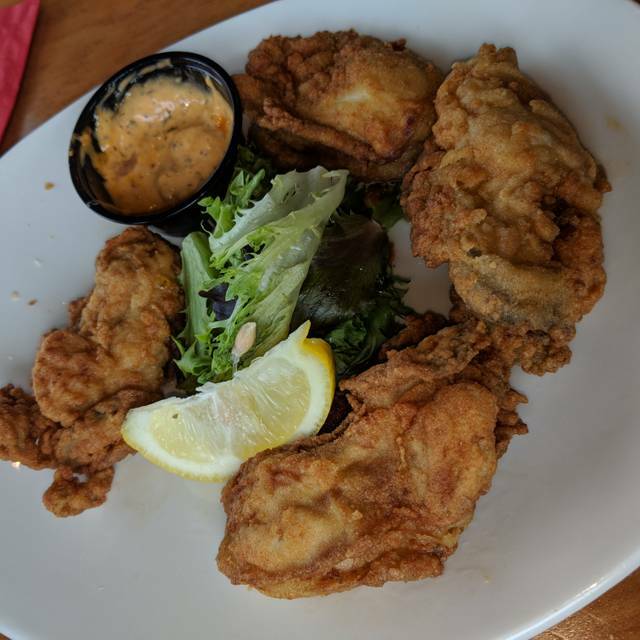 (6) of our colossal oysters breaded and fried to a golden brown. served with tartar and cocktail sauce. a true favorite!!! enjoy (5) of our fresh u-10 scallops - broiled, fried, or pan seared to perfection. served with cocktail sauce or tartar sauce. try our fresh hand battered haddock, deep fried and served with french fries, tartar sauce and choice of one side. a blend of chicken, shrimp, sausage and vegetables in a chili tomato broth and jambalaya rice. served with your choice of one side. a true favorite!!! enjoy our freshly cut, wild salmon topped with a hoisin barbeque glaze and baked to perfection. served over a bed of rice pilaf, freshly sauteed spinach and a choice of one side. fresh cut salmon with an apricot mustard glaze, served with rice pilaf and your choice of two sides. all pastas served with your choice of one side. a delicate blend of fresh fish, clams, mussels, shrimp and scallops in our classic bouillabaisse. served over our fresh parmesan risotto. chicken tenderloins and mushrooms sauteed in a creamy marsala sauce. served over a bed of fettuccini. fresh 8 oz. chicken breast blackened and served over a bed of our fresh fettuccine alfredo. topped with fresh steamed broccoli. 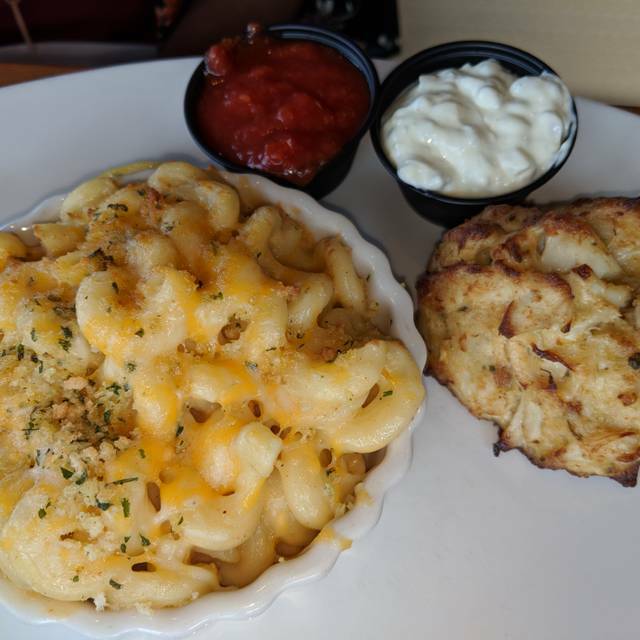 shrimp, crab, and lobster meat tossed in our creamy five cheese sauce and topped with parmesan and cheddar cheese and baked to a golden brown. (5) of our u-15 shrimp steamed and served over a bed of our fresh fettuccine alfredo. topped with fresh steamed broccoli. enjoy a generous portion of our fresh spaghetti and homemade meat sauce with meatballs, topped with melted parmesan and mozzarella cheeses and baked to a golden brown. tender hand breaded chicken tenderloins topped with our homemade meat sauce on top of spaghetti and topped with parmesan and mozzarella cheeses and baked to a golden brown. 2 lbs. 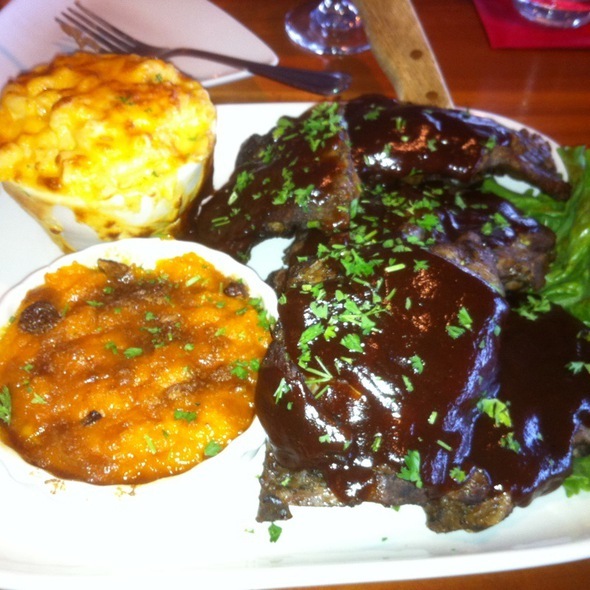 of smoked rib pieces barbequed and piled high with a choice of two sides. our freshly grilled 8 oz. 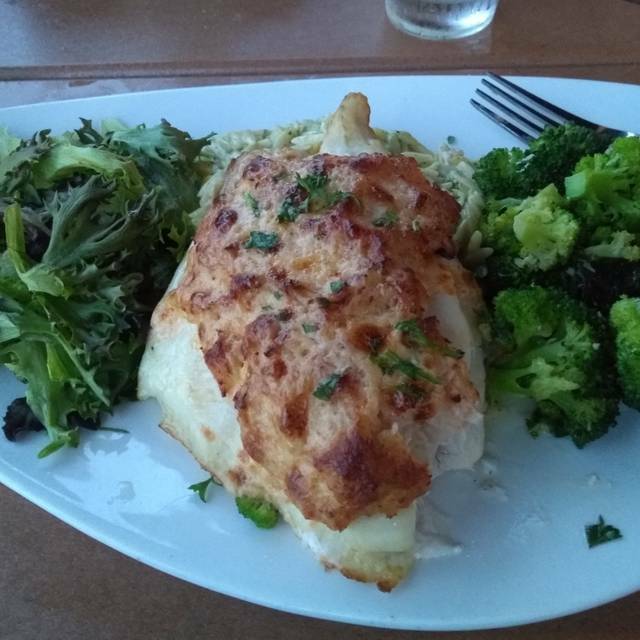 chicken breast, topped with crab imperial and monterey jack cheese. baked to perfection. woodfire grilled chicken breasts served over baby field greens, bistro mashed potatoes, onion straws and topped with a balsamic glaze, with your choice of one side. available sundays, 11:00 am - 2:00 pm. poached eggs, hollandaise sauce and canadian bacon atop an english muffin. served with your choice of ham, bacon, or sausage and home fries. three thick slices of our french bread grilled to a golden brown, then sprinkled with powdered sugar. served with your choice of three strips of bacon, country sausage, or ham slice and home fries. three slices of our french toast stacked with you choice of: strawberries, pecans and whipped cream or strawberries, bananas and whipped cream. served with your choice of three strips of bacon, sausage link or ham slice and home fries. three buttermilk or blueberry pancakes grilled to a golden brown and served with your choice of three strips of bacon, country sausage link or grilled ham slice and home fries. select any three of our fresh choices: mushrooms, onions, peppers, diced tomatoes, bacon, ham, sausage, provolone cheese, swiss cheese, mozzarella cheese, cheddar jack or american cheese. served with your choice of three strips of bacon, country sausage link or country ham slice and home fries. mushrooms, broccoli, tomatoes and american cheese. served with your choice of bacon, ham or sausage link and home fries. rockbass seafood stuffing (crab, scallops and shrimp with peppers, green onions, cheddar jack cheese) served with your choice of three strips of bacon, country rope sausage or ham slice and home fries. two farm fresh eggs cooked your way and served with your choice of ham, sausage links or three strips of bacon with home fries and toast. farm fresh scrambled eggs mixed with peppers, onions, country sausage, seasoned potatoes,cheddar jack cheese and your choice of three strips of bacon, country rope sausage or a generous slice of ham and home fries. enjoy our fresh baked oatmeal served with fresh strawberries, milk, home fries and your choice of ham, bacon or sausage. enjoy farm fresh eggs, monterey jack cheddar cheese, onions, peppers, green chili peppers, tomatoes and bacon in our over sized tortilla shell. served with a side of salsa and sour cream. enjoy crab, jack cheddar cheese, peppers, onions and home fried potatoes topped with two poached eggs and hollandaise sauce. add on choices include:home fries,sausage, bacon or ham for a small additional fee. with your choice of apples or strawberries. homemade peanut butter pie topped with crumbled reese's peanut butter cups. lime juice imported from florida with a flaky crust. topped with your choice of cherry or strawberry sauce. vanilla cheesecake with a raspberry swirl. vanilla ice cream with a homemade chocolate brownie, hot fudge and whipped cream. light and fluffy white cake with strawberry filling. topped with fresh strawberries. layers of chocolate cake with chocolate filling. homemade apple crisp served with a scoop of vanilla ice cream. your choice of vanilla, chocolate, mint chocolate chip or orange sherbert. this menu is for children 12 & under only. no exceptions. three of our award winning steamed shrimp served with cocktail sauce. bucket of fries topped with our homemade cheese sauce. three of our fresh chicken tenders served with barbeque sauce. fresh mixed greens, tomatoes, cucumbers, jack cheddar cheese and croutons. fresh mixed greens, tender chicken pieces, cucumbers, tomatoes and jack cheddar cheese. fresh mixed greens, chicken, dried cranberries, apples, diced tomatoes, candied walnuts and mandarin poppy seed dressing. add lettuce and tomato if you'd like, at no additional charge. served on a kaiser roll and grilled to your dressing temperature. provolone cheese, fresh sliced turkey, bacon, salad greens and ranch. served on mini potato rolls with lettuce, tomato and onion. choose from: hamburgers, cheeseburgers, chicken tenders. (2) tacos prepared with mahi mahi, lettuce, tomato, shredded cheddar and salsa. all pasta served with your choice of one side. served with your choice of meat sauce and marinara. fettucinni noodles topped with our creamy alfredo sauce. freshly breaded chicken tenders topped with marinara and mozzarella cheese. served atop spaghetti and marinara or meat sauce. freshly prepared shrimp sauteed in a garlic butter sauce and served over fettucinni noodles. all entrees served with your choice of two side. enjoy a 5 oz sirloin. grilled to perfection. two of our mini crab cakes broiled or fried. freshly battered fish served with french fries. freshly breaded chicken tenders served with fries, and barbeque sauce. breaded popcorn shrimp served with fries, cocktail and tartar sauce. 12 pound of our freshly smoked ribs served with barbeque sauce. shrimp and crab tossed in our homemade cheese sauce and penne pasta baked to a golden brown. our homemade four cheese macaroni baked to a golden brown. grilled chicken breast topped with american cheese and baked to a golden brown. all kids get a free dip of ice cream or choose from our additional dessert selection. one hotcake with apples or strawberries, one sausage link, one strip of bacon and one scrambled egg. choose from scrambled, sunny side or over easy. two farm fresh eggs with white american cheese. two eggs with tomatoes, broccoli, mushrooms and american cheese. served on your choice of toast with bacon and cheese. served with homefries and your choice of sausage, ham or bacon. with apples or strawberries, served with homefries, and your choice of sausage, ham or bacon. served with homefries, and your choice of sausage, ham or bacon. Did open table reservation for 7 people and we were seated right away when we arrived. Our waitress, Jenn, was very attentive and gave good suggestions on dinner choices. The food was excellent and the portions were very good. Overall great experience! Great food and view of the river. Our service was excellent as well. Thank you!! Meal was rather disappointing. Nice presentation, rather bland in flavor. Fries looked good but were mushy. The server was rather brusque, didn't come back and check on us after the meal came. Didn't ask us if we wanted coffee and dessert. just brought out the dessert tray. Possibly just an off evening. This is our second visit and will be our last. Nice ambiance, very clean restaurant . Great view of the river too. Menu for lunch is boring. Need more seafood choices. We had a wonderful brunch. The mimosas were fabulous as was our meal. We love coming to Rock Bass to catch up. The service is always top notch as is the food. Thanks again for a wonderful meal! Server was attentive and nice. We had reservations for 6:30 on a Friday night and got in without a problem. Food was very good, although some of the entrees were a little pricey so we just got burgers. They were fantastic, though. Will definitely return. We had called ahead since my daughter is vegan and were told that they had the Impossible burger and pasta options. When we arrived, the waitress seemed very put off by our request. Turns out, while they have the impossible burger, it is on a non-vegan bun and they have no bread that is non-vegan. They pasta is not vegan, only the marinara sauce is. They did make a rice and veggie dish that was ok. The seafood was very average, as is the atmosphere and service. Just nothing special at all. Would definitely look elsewhere for seafood. Food was excellent. The waitress was very attentive, nice, and helpful. Much improved from prior visits! I made reservations for a Sunday brunch at 10AM for myself and some family to celebrate a birthday. Most of my family lives far away and we try and take turns traveling to get together for some family time and I had been telling my family for a while how fantastic Rockbass does there brunch. This was by far one of the worst restaurant experiences I have had in a long time and I’m extremely disappointed at the drop off in quality that has happened. We arrived on time to a hostess who was extremely rude. When we came in a 10AM I was informed they where not prepared yet. Which is fine, they just opened I realize people need a little extra time to gather things together. A few moments later I was barked at and asked if I had reservations and I said yes for 10AM and was told okay and then told to follow her in, she then waved at a table and walked away, highly disappointed and rude. I don’t care if you are not prepared on time but do not treat me like crap because you are in a rush. The waitress came around informed us of specials and we ordered drinks, shortly after placed our order. 50 minutes later our food finally came.... 50 minutes. Which I may not be as upset if it wasn’t for the fact that everyone else who came in after us had already been served and some where already finishing. When the food came out it was not hot, some of the breakfast ham was extremely dried out, but at that point we had all been waiting for almost a hour for it to come out. If it was not for the waitress I would have been a lot more upset but she was really trying her best and I want to mention that she was the only person trying. The hostess staff and I believe it was the manager on duty really seemed to not care at all. Cold food and mostly horrible customer service I don’t know if I will return again. I would not recommend anyone to here again. This was a poor service and your hostess needs to get some manners. The food was excellent as always. The service was a bit slow, but still adequate and helpful. RockBass Grill had great food and service. I recommend this restaurant for Seafood. We had a great time. I do wish every booth was overlooking the water. We were greeted and seated quickly, nice setting, approached just as quickly and drinks were ordered and returned promptly. I had ordered the blackened red snapper with Mediterranean tomato salsa. When it arrived didn't seem done. Asked our server to complete the cooking. I recieved a new meal, the peice of fish I had, had a blood line in it making it just inedible so the served me a new meal which was wonderful. Outstanding service, plus the meal was excellent. They way it should be done but by only a few restaurants. Thank you Rock Bass. We had a wonderful time, the server was attentive and entertaining. The food was served quickly and everyone enjoyed there meals. As on previous visits good food in an upbeat environment..new brunch items a real plus! The food here is always on point, it was delicous, but a bit pricey. However, our waitress was too busy flirting with customers are the bar whom she wasn't even serving, the musical duo they had playing was absolutely awful, they could not hold a tune whatsoever. Our server was attentive. Food was great. We did not feel rushed. The food was good but somewhat ordinary, especially considering the price. Our waiter was not pleasant, not interactive, came across as we were bothering him to order or ask for anything. Everything was so Fresh ! Looking out over the water was Breath Taking ! I loved my dessert; we had a huge slice of Carrot Cake ! The Tacos were very tasty; our steak was cooked Perfectly ! Calamari was fried ever so lightly; and the little neck clams were so Fresh and Tastful ! Thank you so much for a wonderful dinner ! Would Highly Highly Recommend. Always a very nice meal at the Rock Bass Grill. Kathy is an outstanding server and was very attentive to our needs. We will be back! If you love fresh fish, you'll love RockBass. Actually all the food is good but when we go there, we focus on ordering the fish. We had business colleagues from out of town and they were impressed with the amount of food we received. When we usually go there, it is typically crowded but this time it was not and it was so much more enjoyable (not having to yell to have a conversation). Seafood chowder was a great starter, but temperature was not as warm as it could have been, and appeared to have sat under a heat lamp for a short period of time (based on surface texture compared to below the surface). The swordfish was very thin cut and was finished as recommended by the server - a mistake I will never make again as it was dry and over-cooked (or sat under a heat lamp as the service was slow). It was average at best, and thankfully served with an acceptable lemon-dill sauce. My mom - who I took there to celebrate her 82nd birthday - had the grilled Mahi, which, thankfully, was better prepared; however, the mango salsa was not the best. I don't think I will return and have fresh fish in the Winter months. Brussel sprouts side - veggie du jour - was great. The view was nice. If I had not taken my Mom there for a special occasion, the food would have gone back to the chef. Went for Sunday brunch. Great food and service. Reasonably priced. Wonderful view of river. We have been here many times but never for a sunday brunch.Was excellent we love the fact you can get anything off the menu and the portions are great as well.You wont go away hungry that's for sure .All our servers were very nice and tells you about any specials or if somethings really good etc. We were there by request from out-of-town family. We had taken them there for Sunday Brunch and they LOVED IT !! Everything about it is great! Crab cake was delicious, however steak was not very impressed with. Creme brulee was terrible! Bread was stale. 2nd time here. No complaints or negative comments on our experience. I will point out though that, surprisingly, it was low in customer count for a Saturday evening at 6:30/6:45 PM. But there is plenty of competition in the area. Very nice place. Food was hot, delicious and plentiful to be able to take home for next day. Would come again. Hope quality is still there. Only real constructive criticism I would have is to make the booths a bit more sturdy & high back. I was bothered, not enough to complain, by the couple sitting in the booth next to us. It were the booths in the bar section against the wall. When the one person behind me would lean backwards hard or fast, it shook my side of the shared backing and once hit me in the head with hers. She did excuse herself. It just became annoying after a bit, especially when dining. But food was still good. First time dining at rock bass grill.service was good food was good kind of disappointed with the surf and turf.steak was delicious but the lobster tail was a bit small. Super friendly staff from the time we walked in until the time we left. The manager came by and did her obligatory table touch once the main course came, which is always nice. The Ahi tuna was delish! Perfect timing between courses; we didn’t feel rushed at all. Our server (older lady, dark hair) was a sweetheart. We’ll definitely be back. Great time at Rock Bass Grill on Valentine's Day. As usual, the food and Service was outstanding. Great food and service. This was our first visit. We plan on adding the Grill to our favorite dining spots. 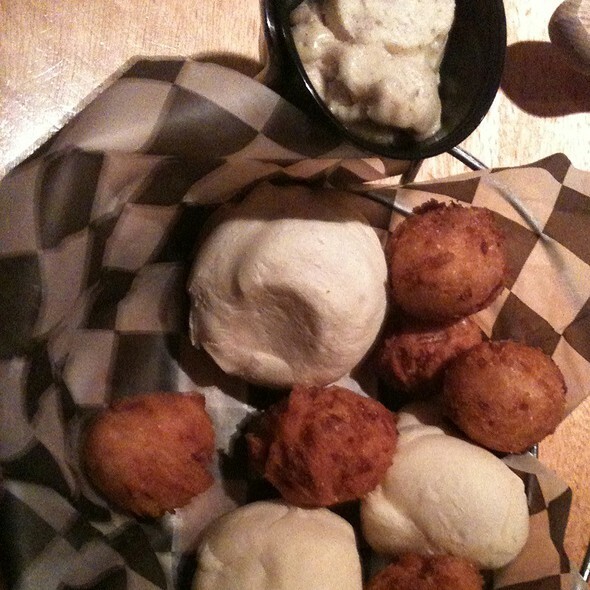 I was disappointed that the bread was cold and the hush puppies were hard. The service and ambiance were great. The main dish was very good. 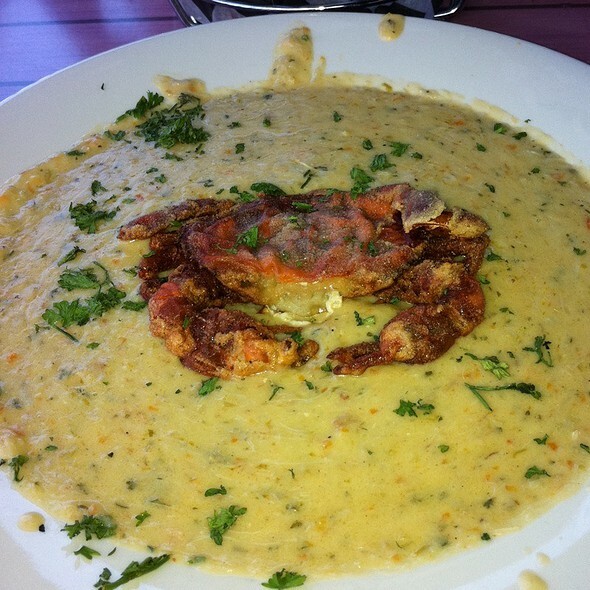 The crab imperial was a little bland. The sides and desserts were very good. Server was impersonal and abrupt. Offered no drink refills to any of the table. Checked on a group of 6 maybe twice the entire time. The restaurant was not busy by any means and staffing appeared more than adequate. Portions were small for the price. Food took too long to bring out as well. Food quality was good however, except for the bread. The hush puppies were cold and rock hard. The butter was old and tasted odd. We usually enjoy Rock Bass Grill. This particular night, the service was not good and the food came out cold. All in all not a good night.